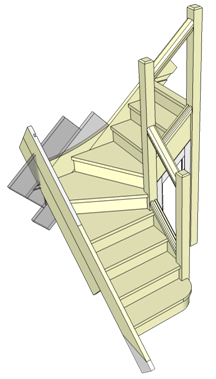 Sample of Martin's Google SketchUp 3d Model - Winder Stairs. Manufactured by advanced bench joinery apprentices as part of their college practical work. Martin is a retired lecturer from Preston College specialising in Advanced Bench Joinery, ICT, Computer Aided Design and Developing People. He has time now to consult on CAD / CNC operations for a local Construction and Architectural Joinery Manufacturer. He was also involved in authoring the interactive CAD drawings for a Joinery Teaching CD in the Heinemann range from Pearson Publications. He consults and delivers Woodworking Machine Safety Training for a High Quality Engineering Company. All of Martins advanced drawing and teaching aids are developed in Autodesk AutoSketch and Google Sketchup with the models being available for inspection and for students to freely download from the Google 3d Warehouse by searching here. Director of adult students where as a member of the senior management team he had direct responsibly for the Colleges full and part time adult students. Guidance manager where as a manager within student services he had responsibility for the welfare, counselling, careers and higher education guidance for all the colleges full and part time students. Employer liaison senior tutor as Martin became a Senior Tutor he took this employer focussed role and many a construction company, employer and member of the National Federation of Builders will remember Martin visiting them to discuss their training needs and review the progress of their apprentices and trainees. Assistant dean - adult admissions here Martin lead the team of admissions managers and advisors responsible for (IAG) Information Advice and Guidance for the Colleges full and part time adult students. This included the college advice centre, promotions unit team and Probation Service education, training and employment team visiting probation offices and prisons across Lancashire. Martin and his team spent many hours giving IAG in the town centre and housing estates of Preston, Chorley, Garstang and Lancaster the You Tube link below giving a flavour of the promotion team in action. Construction head of provision and joinery section leader in his time at the college Martin also took the roles as curriculum managers in the construction academy. OCNW - Open College of the North West Coordinator here Martin represented the College and its adult students at OCNW coordinator conference and development meetings. This page was last edited on 4 May 2016, at 14:52.